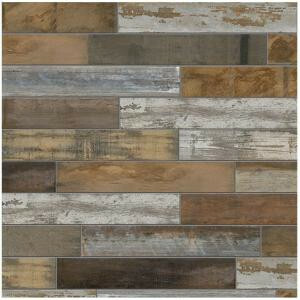 The Montagna Wood Vintage Chic by MARAZZI is a 6 in. x 24 in. porcelain tile designed to convey the look of painted wood that has been weathered and reclaimed, a rich blend of shades and textures ideal for modern floors and walls. Aged-to-perfection ranges of white, gray and brown unite with authentic wood graining to create a dramatic sense of movement. Express your personal style by installing Vintage Chic both horizontally and vertically using standard off-set linear layouts or mix it up with chevron and herringbone patterns. Buy online MARAZZI Montagna Wood Vintage Chic 6 in. x 24 in. Porcelain Floor and Wall Tile (14.53 sq. ft. / case) ULRW624HD1PR, leave review and share Your friends.